Guam is located in close proximity to many Asian countries including Japan, Korea, Philippines, Hong Kong, China and Taiwan. 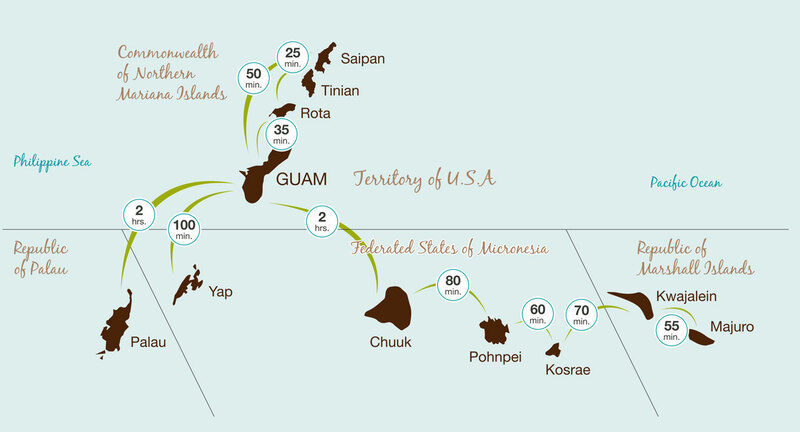 The average travel time from Guam to key Asian cities is 3.5 to 4.5 hours. Travel time to Hawaii is 7 hours. China is served on a regular charter basis from Shanghai, Guangzhou Beijing and Hangzhou. The international airlines listed here offer connecting flights to virtually all major cities worldwide. Domestic commuters are run by Cape Air, and STAR Marianas Air. For car rental, a U.S. driver's license can be used; foreign visitors can use their home country licenses for up to 1 month. Shuttle buses are available from most hotels and Duty-Free Shopping Galleria in Garapan. Taxis are available, and many hotels offer airport pick-up and drop-off. United Airlines with daily flight direct from Guam, and 2 flights a week direct from Manila, Philippines. Delta Air Lines with 3 flights a week direct from Narita, Japan to Palau. Asiana Airlines with 4 flights a week direct from Seoul (Incheon), Korea to Palau. Korean Air with 2 to 3 flights a week direct from Seoul (Incheon), Korea to Palau. China Airlines with 4 flights a week direct from Taipei, Republic of China (Taiwan) to Palau. Palau Airways with 3 flights a week direct from Taipei, Republic of China (Taiwan) to Palau; and 2 flights a week direct from Hong Kong to Palau. Japan Airlines with regular charter flights direct from Kansei, Japan and Narita, Japan to Palau. Travel to Yap is available via United Airlines. Travel to Chuuk is available via United Airlines and Air Niugini. Travel to Pohnpei is available through Guam and Hawaii via United Airlines, Air Niugini and Nauru Airlines. Click here for more information. Getting to Kosrae is near the equator in the central Pacific (5 degrees North and 163 degrees East) Kosrae is on the United Airlines Island Hopper route (flight UA172 from Guam and flight UA153 from Honolulu) which travels 4 times a week between Hawaii and Guam.